In 1949, Chu Followed the army to Taiwan and served in the Ministry of National Defense. During his career in the military, he spent his free time reading and attending art- related activities, to help dispel his loneliness and homesickness. In 1953, Chu studied drawing, watercolor and oil painting under his first teacher, Liao Chi-Chun. Poring through books and magazines in Liao Chi-Chun’s studio exposed him to Western art. After some time, Chu was sent back to fight in the frontlines. Upon his return to Taipei, he was stationed at Chingmei Elementary School. There he met two art teachers. Ho Kan and Hsiao Chin, who invited him to attend the meetings of the Ton Fan Group in 1958 and participated in their second exhibition. 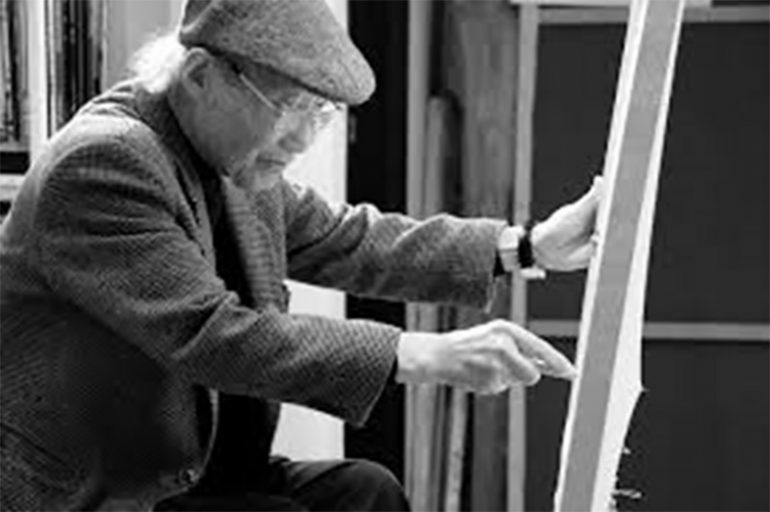 Although he did not study directly under Ton Fan Group mentor Lee Chun- Shan, Chu was greatly influenced by the contemporary art master. Lee had called on his students to discover their own unique language and to combine Chine artistic traditions with modern art concepts. He taught them not to learn his techniques, but to be yourself and walk your own path. Chu changed his name to Wei- Bor, which means white, pure, empty and limitless. He came up with the idea of creating abstract art within the Eastern cultural tradition. But rather than using paint and brush he would use knives and scissors. He use the act of slicing or rupturing to create a different kind of work. His artworks blur the lines between the two dimensional and three dimensional. Using tailor’s tools and materials, Chu employs techniques such as slicing cloth open and interlacing cloth of various colors in the background, wrinkling cloth to create textures, and cutting out strips of cloth and curling them. The use of a knife to slash and pierce tightly stretched canvas was pioneered by the Italian artist Lucio Fontana (1899-1968), who founded the Spatialist movement. According to Chu Fontana is like a bridge, for someone from the East to cross that bridge erected by Fontana, He certainly need to bring something new to the picture. Comparing Chu Wei- Bor to Fontana, the artist Chu ko mentioned that Chu’s way of digging out holes differs from Fontana’s way of punching holes. The former works from an orientation of stillness, the latter from one of motion. Chu Wei- Bor seeks to express purity, simplicity and sincerity in his works. As an Eastern Artist, He would like to bring out the concept of serenity. A place that is so serene that there are no waves. But from serenity comes action. His main goal is to seek a level that is higher and deeper, to find spirituality within. Through rupturing, he creates a sense of space that continues onwards, embodying the concept of limitlessness. In his sixty years of art- making, the desire to discover new forms of artistic expression has pushed Chu to work with different mediums. 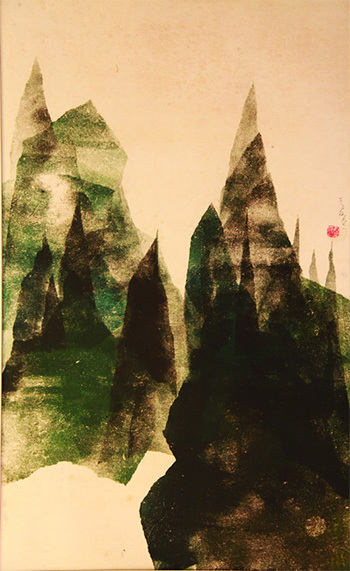 Early in his career, he created colorful abstract glass prints and woodblock prints depicting nostalgic rural scenes. Presently, he utilizes ordinary materials such as paper, cloth, cotton swabs needle and thread. For instance, he binds paper sheets together and cuts out shapes from multiple layers to produce a three dimensional effect. Chu even transforms cotton swabs into works of art by arranging ink- stained cotton swabs into fluid compositions.